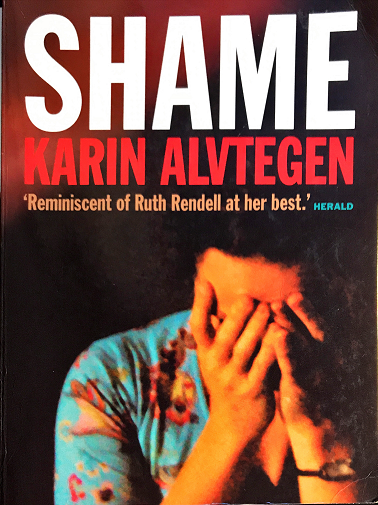 SHAME has languished unread on my shelves since I found a second hand copy in Australia’s only bookshop specialising in crime fiction 8 years ago. I can’t explain the languishing as I have loved both of the other books by Karin Alvtegen that I have so far read (MISSING and BETRAYAL)…perhaps it was my subconscious reminding me of my dislike of second hand books. Whatever the reason, I could kick myself as the book is really, really good. Like Alvtegen’s other work SHAME only fits within the confines of crime fiction if you’re open minded about how to define the genre. I’m very comfortable with this kind of elasticity but if you’re not, consider this fair warning. It is the most aptly named novel I have come across in quite some time as it displays and dissects the shame felt by two women and the long-lasting effects these deep feelings have on their lives. Monika is a successful doctor with a less than perfect personal life. She has never allowed herself to be properly loved but when we meet her a man called Thomas has entered her life and Monika dares to believe that things might be different this time. Just as she decides she will share her secret shame with Thomas and see if he still wants her a dramatic event occurs. An event that proves to Monika she is not worthy of love. Not deserving. And she must do whatever it takes to make amends. About the only thing Maj-Britt is successful at is eating. She has become so good at it that she is virtually housebound by her obesity and needs all sorts of home help just to survive. She is also mean-spirited. And just plain mean. Many of the helpers who have been assigned to her case won’t return because she is so horrid to them. Maj-Britt has a dark secret too but even before her darkest day she was almost full to the brim with the shame of knowing she had displeased her parents and their god. For three quarters of SHAME the stories of these two women do not overlap. Their individual sadnesses, anguish and despair are revealed in parallel but separate threads with Alvetegen’s usual sparse writing and incisive observational eye. She really does have an affinity for bringing the voice of the world’s outsiders to life. There’s no overt sentimentality or mawkishness yet no deliberate unkindnesses either. I often find attempts at this kind of characterisation are either too politically correct for credibility or have ramped up the cruelty in some misguided attempt at ‘grittiness’. Neither Monika or Maj-Britt is particularly likeable in the usual sense of the word, probably not the type of literary character that will end up on lists of fictional beings to invite to a dinner party, but I found them believable, compelling and increasingly sympathetic as their secrets were laid bare for us. Even Alvtegen’s minor characters are pitch-perfect. The two women who end up tying Monika and Maj-Britt’s stories together in the novel’s final act are Ellinor, the latest and most robust of Maj-Britt’s home aides, and Vanja who reconnects with Maj-Britt nearly 30 years after they were teenagers together in the same small town. Both characters are deftly drawn. As are the women’s parents who – it must be said – have a good deal to answer for, especially in the case of Maj-Britt. I’ve read a lot of stories in which awful things are done to children but the depiction of the way her parents ‘deal’ with Maj-Britt’s childhood ‘sin’ left me speechless at the insidiousness of their particular brand of abuse. I have to hope it was entirely from Alvtegen’s imagination. I was a smidgen disappointed by the book’s ending. Not hugely and only when compared with the rest of this book; it’s still a cut above the vast majority of endings I encounter. But it was a little too clunkily neat for me…and for what had gone before. Though perhaps Alvtegen was concerned about leaving her readers in abject despair. It is a minor reservation only and should not prevent you from embarking on this beautifully told, sometimes challenging and never dull tale. This entry was posted in book review, Karin Alvtegen, Sweden. Bookmark the permalink. I like Alvetegen’s work, too, Bernadette, but I’ve not (yet) read this one. I’ve heard, though, that it’s quite good, and one of the things she does well is her characters. It sounds as though she hits the mark with that here, too. It is both brave and difficult to create truly sympathetic ‘unlikeable’ main characters. This sounds as if it manages beautifully. Thanks for another detailed and compelling review. Sounds like there’s too much cruelty for me at this point. I like books where two characters lives come together sometime along the way. I will look out for this one. I haven’t read anything by this author so far.